A United Nations committee has added a number of North Korean individuals and firms to a sanctions blacklist. Five individuals, five firms and two weapons-related items are subject to the new sanctions regime. A UN resolution in June toughened sanctions against North Korea after it conducted nuclear and missile tests. The last time the UN imposed sanctions on Pyongyang, it responded by carrying out a nuclear test, says the BBC's Laura Trevelyan in New York. 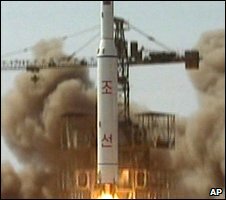 According to the UN Security Council sanctions committee, nations are now banned from doing business with five firms involved in North Korea's nuclear programme, and five individuals are to have their financial assets frozen and face a travel ban. The UN resolution in June called for inspections of ships to or from North Korea believed to be carrying goods connected to weapons of mass destruction. It also broadened the arms embargo and further cut the North's access to the international financial system, but did not authorise the use of force. Ties between North Korea and the outside world have grown extremely tense since it walked away from six-nation talks aimed at ending its nuclear programme. It subsequently said it would "weaponise" its plutonium stocks and start enriching uranium, prompting fears that it is working to produce nuclear warheads small enough to put on missiles - though analysts say it could take a long time to do so.